We are dedicated to helping businesses take advantage of the power of gift cards and gift certificates to maximize profits. Gift Certificate Central provides everything you need to plan and execute a profitable gift card and gift certificate program in one convenient package: hundreds of design options, precise record-keeping, worry-free security, distinctive packaging, and promotional sales tools and strategies -- now just a mouse-click away! 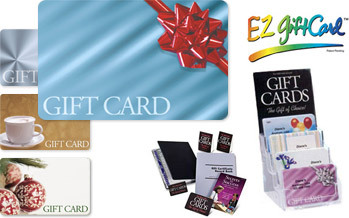 Gift Certificate Central is a division of Data Management, Inc., founded in 1961. We can custom-design and produce just about anything your marketing mind can imagine. Our stable of products includes plastic and paper EZ Gift Cards, EZ Reward Cards, and our 3 styles of Gift Certificates: Gift-Track, Duplicate, and Deluxe. We can personalize and customize any of the cards or certificates so that your business is represented exactly the way you want it to be. EZ Reward Cards are a program designed to reward your customers for their frequency of visits or the amount of money they spend. The program is designed to create a relationship of loyalty beyond satisfaction. As a business owner, you must go beyond simply satisfying your patron’s needs. The customer must feel like an important client, a valued customer. There are many popular titles to EZ Reward Card programs like VIP, Member, Referral, or Rewards. No customer should leave your business without a card that will bring them back or refer your products or services to a friend. EZ Rewards Cards are available in 30-mil plastic or 15-point coated paper cards. We also offer hand-held punches, self-inking stamps, or stickers to show usage on the EZ Reward Cards. Included free with your first order is a sign with your card affixed asking your customers to inquire about your Rewards Card program. Our Gift-Track™ System is so easy to use! Our patented Gift-Track™ Gift Certificate system makes it easy to keep track of every gift certificate with perfect accuracy. You only have to write key information once, saving time and reducing errors in record-keeping. Sequential numbering on the certificate allows you to match the original journal entry upon redemption by a customer. At that time, the information is entered on the back of the certificate and in the journal. Our convenient one-write journal easily tracks balances, summaries, and analyses. And your certificates and journal book all fit neatly in a 9" x 9" padded system case, with simple instructions inside to help you keep flawless records immediately. That's the Gift-Track™ Gift Certificate system, your best choice for your gift certificate program! A quality image -- our gift certificates represent your business in the best possible light! We produce a number of attractive certificate designs that are perfectly suited to your business. The certificate will promote your good name, imprinted free of charge, or we can print your business's logo in color or black ink. Our materials and production quality are always first class, at a price that can't be matched! Our talented designers can also create custom gift certificates to communicate what's truly unique about your business. Our high-security features prevent forgery and fraud. With Gift-Track™ Gift Certificates, if somebody tampers with the amount on the original certificate -- or tries to make copies -- you'll always know. You can always tell a photocopied certificate from an original. On the back of every certificate, we print a "High Security Document" padlock. It contains the words "Valid Certificate," in MicroPrint type, which can only be read with a magnifying glass. These words are illegible on a photocopied fake. Your certificates come consecutively numbered, too. So it's easy to match every redeemed gift certificate with its proper entry in the journal book, which is always available to check inconsistencies or errors. Duplicate Gift Certificates increase customer loyalty with a distinctive, memorable image. Choose from two traditional styles with free color-coordinated envelopes to impress both your customer and the recipient. (Other designs are available for an additional charge.) Your business name and address are printed in crisp, black ink in your choice of eight typestyles on 20-lb. NCR paper (original is white, copy is canary). Enjoy simplified record-keeping. Two-part, carbonless gift certificates with consecutive numbering assure accurate, secure records with just one writing. And, with your first order, you get a FREE Gift Certificate Record Book (400 entries) to help you manage your gift certificate program. Distinctive packaging helps make for a memorable gift. FREE envelopes accompany every gift certificate order. FREE promotional kit when ordering Gift Track, Duplicate, or Deluxe or gift certificates. You'll receive a FREE Point-of-Purchase Sign for your counter. This good-looking display, with a sample of your certificates already attached, lets all your customers know that you offer distinctive gift certificates for their shopping convenience. You'll also get a FREE two-sided window decal for your entrance to entice passersby. First-time buyers also receive two FREE table tents, to remind patrons that you offer gift certificates worth buying, and a "Secrets to Success Through Gift Cards and Gift Certificates" handbook, which shows how to develop a program to make more gift card and gift certificate sales for your establishment. Other promotional materials are also available. Customers call us every day to say how proud they are of their gift cards and gift certificates! We want you to be, too. So we guarantee your complete satisfaction 100%. If you're not happy with your order, for any reason, you can return it within 90 days for a full refund, credit, or replacement.